Provide comfort for the family of Lola Whited with a meaningful gesture of sympathy. Lola Jean Shannon Whited, of Smiley, Texas, went home March 18, 2019, to meet her heavenly Father and her husband, Floyd Eugene Whited. Lola was born in Austin, Texas, on October 7, 1949. 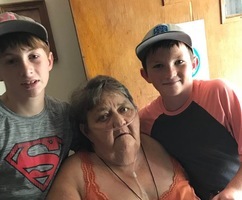 She is survived by her sons, Randy Whited and wife Rhonda, Floyd Scott Whited, Kenneth Whited, and Brandon Juarez and wife Christina; her grandchildren, Melissa, Kimberly, Johnathan, Casey, Corey, Cade and Riley; and a great-grandchild, Adelyn. Lola was a funny woman, always joking and living life the best she could. She loved her sons and raised them in Elroy, Texas. After her husband, Floyd, passed away, she moved to Smiley to be closer to her brother, William and wife Linda, sisters, Darlene and husband Mike, and Valerie and husband Bill. Lola was known for her laughter and great jokes. She brought so much humor to any small or large shindig. You always had to make sure you held your shorts or pants as she would drop them to the ground in a split second. She loved Jesus and gospel music. She went to church at Hornsby Bend Assembly of God where Brother Avery and Sister Avery always kept her loving the Lord. She was an Elvis fan forever. Lola was a great grandma, who loved all of her grandbabies dearly. She was a great cook. She made homemade biscuits, hamburger meat and pork and beans, peanut butter cookies, and anything you’d want her to cook to make you happy. She enjoyed watching old re-runs of “I Love Lucy” and “Gunsmoke”. 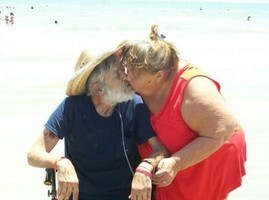 She loved the Lord with all of her heart and ached to be returned to Floyd’s arms. She is now at peace and will be missed by many. Visitation will be held at the cemetery one hour before the service. Pastor James Avery will officiate. Memorial contributions may be made to the charity of one’s choice. To send flowers in memory of Lola Jean Whited (Shannon), please visit our Heartfelt Sympathies Store. Provide comfort for the family of Lola Jean Whited (Shannon) by sending flowers. I’m so sorry for the loss of your Mom Lola. She was a great person. I sure loved that Lady. Sending prayers. She always made my babies hamburger meat and pork n beans and I did not like it so she would make me rolled up tacos before adding the pork n beans.